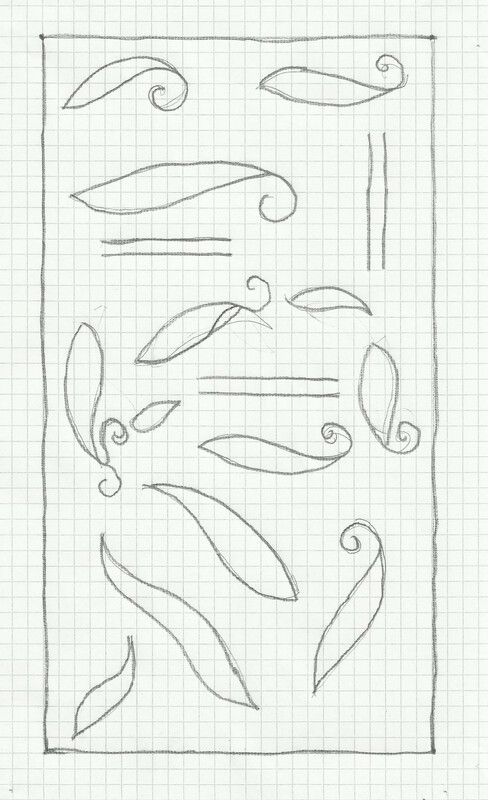 I could work woven chain bars on some of the paisleys. Polyester threads are used to work these woven chain bars. The chains get twisted quite often, which is slightly irritating. The zigzag chains are worked individually to minimize this twisting. The paisleys are worked in green threads. Apart from satin stitch variations, the other stitches used for filling are- buttonhole variations, stem stitch, chain stitch, herringbone, running stitch, weaving. 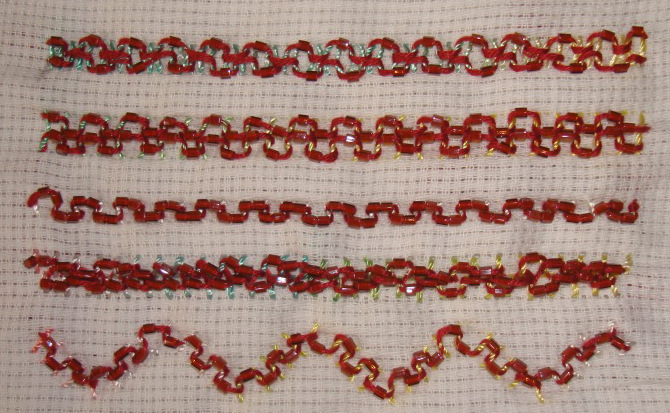 After completing the fillings, today, I started working the woven chain bars. It is time consuming. I am still catching up on TAST stitches. Kiko’s flower stitch tutorial is here on Pintangle. Though this was part of earlier TAST challenge, it was not explored then. 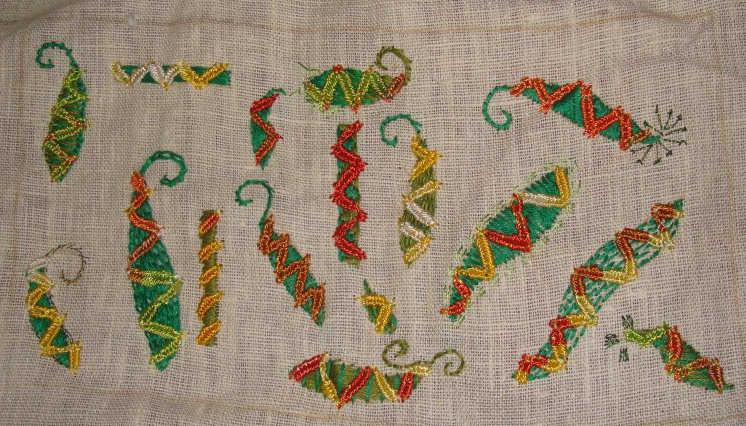 At that time I was terrified of bullion knots. This stitch is combined with other stitches in this pattern sampler. Kiko’s flower stitches are worked with- chain stitch, herringbone stitch, buttonhole stitch and feather stitch. The other stitches in this second part of the sampler are- woven chain stitches, triple chain stitches, french knots and coral stitch. 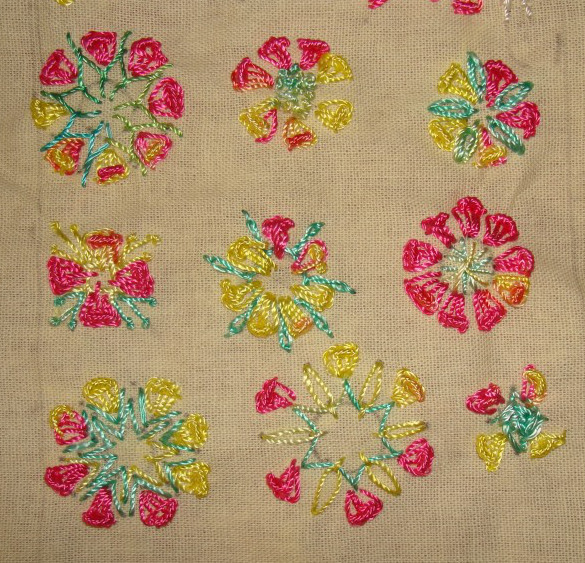 This part of the sampler is decorative florals made of kiko’s flower stitches and other stitches. the details of other stitches. 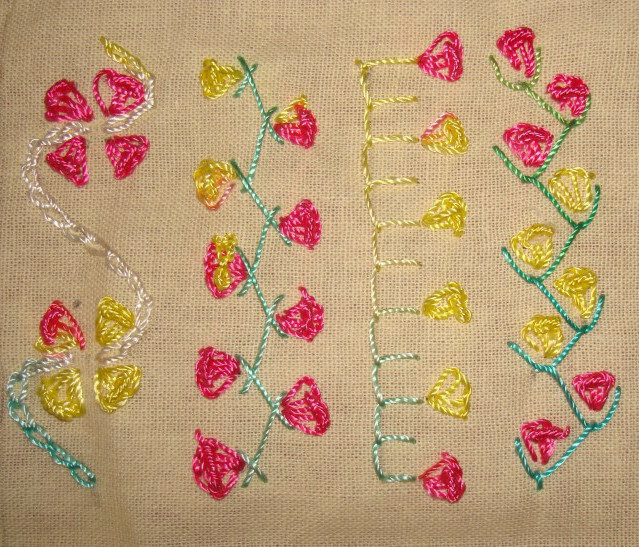 These florals started with cretan stitch ring, french knots centre and berry stitch petals. First sample has square herringbone and pistil stitches, second sample is made of basque stitch ring and the Algerian eye stitch forms the centre for the third sample. 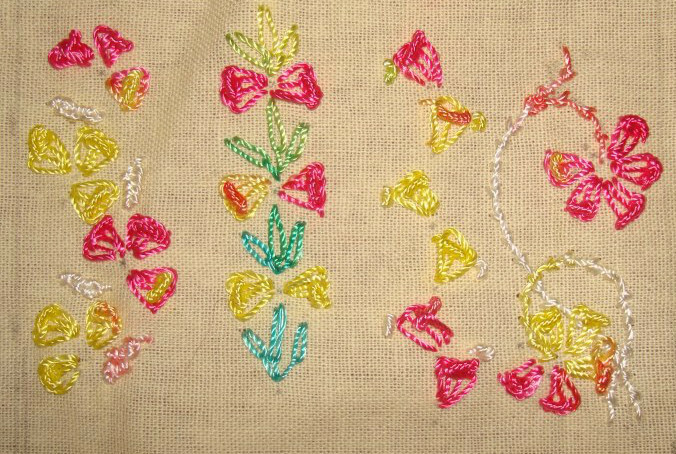 The first sample has arrowhead ring, slipped detached chain stitch ring is the base for the second sample and whipped square and a variation of kikos flower stitch [the buttonhole stitches after the first buttonhole stitch are shorter , making the bullion stitches angled] form the third motif. 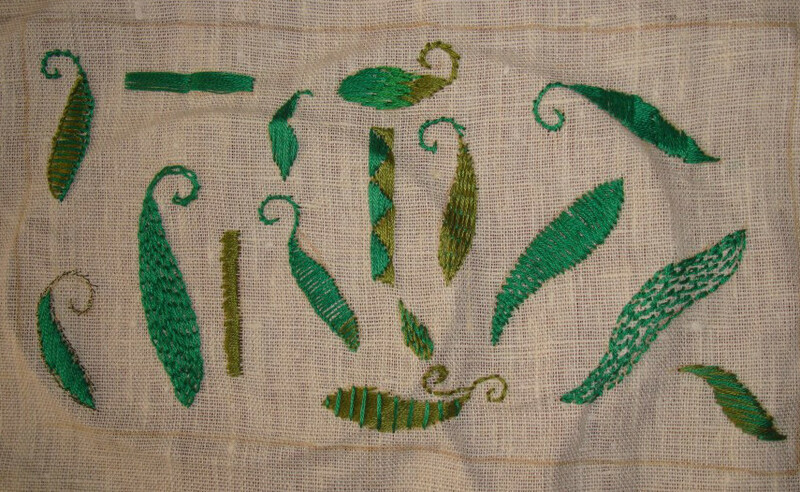 After working two more samples with buttonhole stitch, fern stitch and fly stitches ,the sampler was completed. This cannot be called a simple stitch, but it was easier than I expected. One tip- it is best to work the other stitches first [especially the chain stitches] because the thread gets entangled over this textured stitch. After working a few more beaded lock stitches the sampler was completed today. The first sample was worked on long and short straight stitches. It is not pretty, the lock stitches twisted the straight stitches! The beaded lock stitches are worked on three step feather stitch in the second sample. The third sample is beaded lock stitches worked over herringbone stitch and the Italian border stitches form the base for beaded lock stitches in the fourth sample. The stitch is a buttonhole variation, the beaded lock stitches were worked from right to left, after trying in different ways, settled down to the last samples on the left side in the first sample. Fern stich came later in the TAST list, still ended up as the base for the second sample. Wheat ear stitches are worked with beaded lock stitch in the third sample. Sheaf stitches form the base to work beaded lock stitch in the first sample. In the second sample, the beaded lock stitch is worked at the top, and the bottom is twisted and beaded, extra straight stitches were used for this. 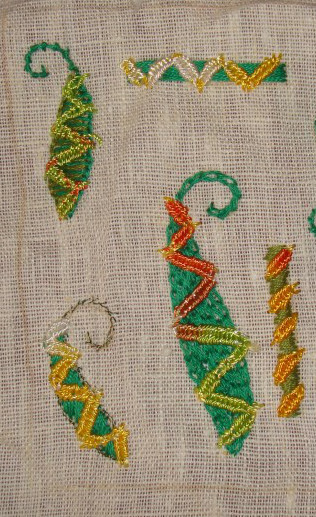 The straight stitches were beaded in the third sample. Beads are added to double lock stitch in the last sample. It was interesting working on this stitch. Some pointers-The beads are not that secure, which makes them turn in all directions, the space between the straight stitches and the bead size needs to be same. Sometimes when pulled tight, the lock stitches twist the straight stitches. This stitch can be added for extra texture, that way beads will rest comfortably and enhance the look of another stitch. This is the third variety of lock stitch, the working of which is on Pintangle. This was the 131st week stitch. This sampler was started with basic straight stitch variations. The beaded lock stitch on them is started today. 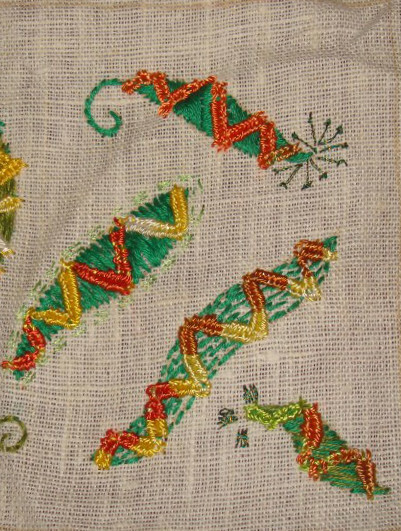 The straight stitches do not have any gaps and the two rows of beaded lock stitches are worked on alternate straight stitches, which tilts this stitch to the left. All the lock stitches are beaded in the second sample. Two beads are worked in this single row in the third sample. Two rows of short straight stitches were worked one below the other and the beaded lock stitches were worked on them in the fourth sample. This variation need to be written down before it slips the mind! The straight stitches are worked in a curved pattern which has created this curved beaded lock stitch in the fifth sample. 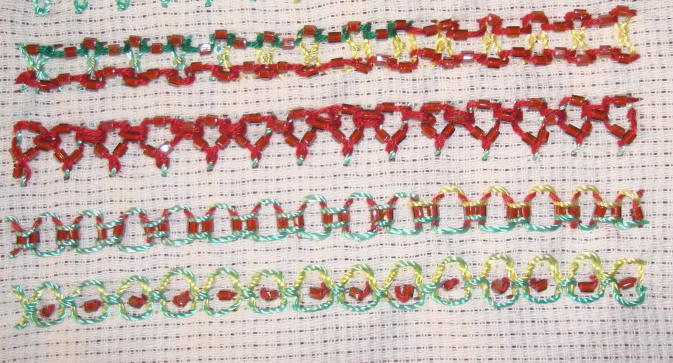 The first two samples have straight stitches in varying heights in a pattern, it was not pretty to work the lock stitches on varying heights, so beads were added at the end of the straight stitches in the first sample and even that was not done in the second sample. Learnt this lesson. 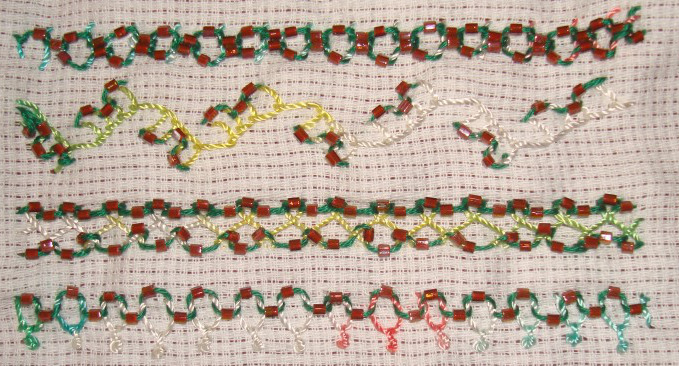 Alternate lock stitches are beaded in the third and fourth samples in two ways.